The traffic doesn’t end on the roads in California. The Golden State has one of the busiest air ways in the entire country. With some of the most populated cities in the nation and vast amount of state territory, California is a must stop destination for tourist, travelers, and people seeking gold. Although the last one might be a few hundred years too late. The airports can be daunting, if you don’t know anything about them. That’s why we’re getting off the roads and into the sky to tell you about the best and worst airports in California. LAX is the most popular airport in California and the second most popular airport in the country, Los Angeles International airport is consistently booked with incoming and outgoing passengers. It’s also known for its construction zones, bustling traffic, and pricey foods. Things can get chaotic here. So, if you want to avoid flying into a busy airport, then LAX might be a bad option. 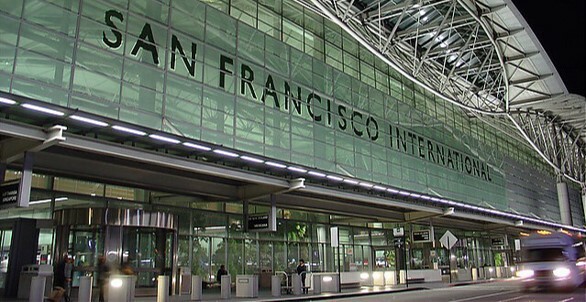 Located south of downtown San Francisco, the San Francisco International airport is the busiest airport in northern California. This airport has its share of art installations and visual appeal. It’s also home to its very own museum that was established in 1980. SFO is a moderately busy in relation to LAX, but it doesn’t have the same reputation as its southern counterpart. San Francisco International, when prepared, will be a breeze to navigate for any airway passenger. If you need to touch base near the Disneyland Resort, John Way Airport is your ticket. This is LAX’s smaller neighbor who receives around 9 million passengers a year. It’s busy, but it’s not that busy. If you fly into this airport, you’ll also get to see the statue of John Wayne himself greeting you on a safe landing. San Diego International airport is a great destination for anyone who wants to visit California’s southern border. Its clean and open airport is a great place to fly in for large parties and individual passengers. One fact you might not know about this airport is the sectioned nesting ground for endangered species. Also, San Diego International airport was ranked #2 in best airports in the world. San Jose is the largest city in the Bay Area, but San Jose International is the smallest airport in the area. Compared to others, San Jose International has received the fewest accidents in the past 30 years. It’s a safe landing, take off, and it’s a smaller airport. If you’re traveling to San Jose, then consider taking SJC. Ah, yes! The capital city of California. SMF is the international airport for this metropolitan area. Known for its cleanliness and sleek design, the Sacramento International airport is a sight to admire. You won’t have any problems navigating through SMF. As long as you have all your traveling documentation and your luggage is light, passing through Sacramento will be a fun, casual experience. The Vandenberg Air Force Base is a fantastic airport. You’ll see local flights, international flights, and… outer planetary flights. Actually, it’s a space and missile testing base with the goal of placing satellites into polar orbit. It’s not open for commercial passengers, but it is a great airport, because it’s Air Force owned and operated. So, unless you’re a long-range ballistic missile, maybe consider flying into somewhere else. Did you know that Hollywood and Burbank have their own airport? Neither did we! If you’re aiming to fly into an area for a quick film pitch before your noon lunch, then the Hollywood-Burbank Airport is your destination. Located north of Downtown Los Angeles, BUR is light on air traffic, because it’s also a local flight only airport. All the big airliners are flying into LAX. But, if flying isn’t an option and you’re afraid of receiving a traffic ticket when you drive, just remember that Myimprov.com has your back. We have the best traffic school online California has to offer. If you enroll in a defensive driving course, you can lower the price of annoying tickets that you accumulate from not flying to your next destination.